If you’re looking to relocate or remove a spa- you’ve come to the right place! 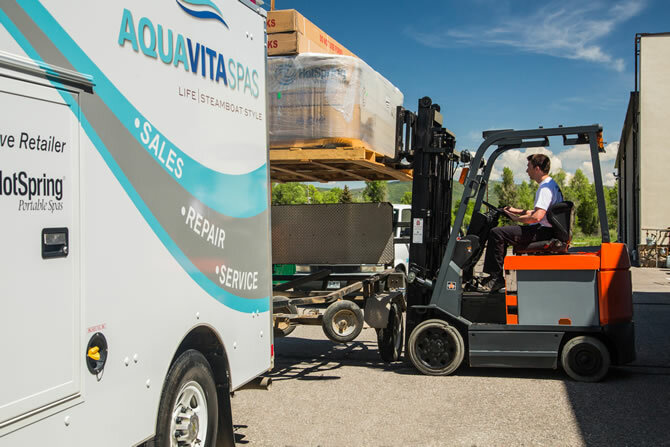 With over 40 years in the business, Aqua Vita has the expertise and equipment necessary to relocate or remove your old spa without damage to your property or landscaping. Aqua Vita Spas offers a turnkey Spa Relocation Service. With this service we will get your spa relocated, set-up, electrically hooked-up, filled, and started. With this service you’ll be enjoying your spa in no time! Getting rid of an obsolete hot tub is definitely a job for the pros at Aqua Vita. We will ensure your hot tub is prepared for a proper “Earth Friendly” disposal before delivering it to the landfill. Whatever your hot tub needs, we are here to help! Simply fill out the form with the relevant information, and a member of our team will contact you shortly.